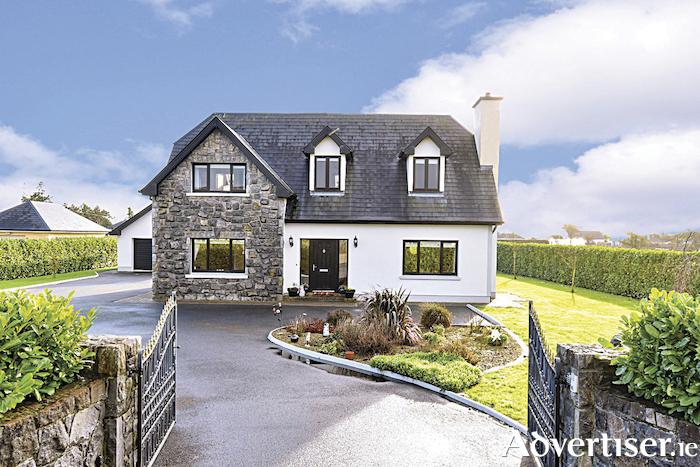 Sherry FitzGerald presents to the market this large detached family home at Kilcahill, Claregalway, for sale by private treaty. Located just off the N17 Galway to Tuam road, close to popular local school, the property is within easy reach of Galway city centre and the M6, M17, and M18 motorways. Constructed in 2008, the property is situated at the end of a quiet cul-de-sac. This home has been developed with care and attention to detail, it is fitted to a very high standard throughout including kitchen and bathrooms. On the ground floor the fitted features include tiled and solid timber floors, granite internal sills, natural stone fireplace in the living room with solid fuel stove with back boiler, and high quality fitted kitchen and bathrooms. The house has oil fired central heating, solar panels, and is an energy efficient B3 rated home. The accommodation is bright and spacious throughout and includes sitting room, large family kitchen/dining room, conservatory, bedroom with en suite, utility, and downstairs toilet on the ground floor. There are three further bedrooms on the first floor, with en suite and walk-in wardrobe to the main bedroom, and a bathroom. Asking price is €410,000. The gardens are well planned, mature, and meticulously maintained. The property is entered via electronic gates onto a tarmac drive to the front, side, and rear. There is a raised Kilsaran paved patio off the dining room and conservatory area, and a south facing rear garden. There is a large double garage with electronic roller doors (8.77m x 6.8m ) and storage area. Overall this is a wonderful family home and viewing is highly recommended. APP Kirrane Auctioneering has arrived!